Another book that I read while we were away was an ideal book to pick up and put down between bookshops/ places of interest. 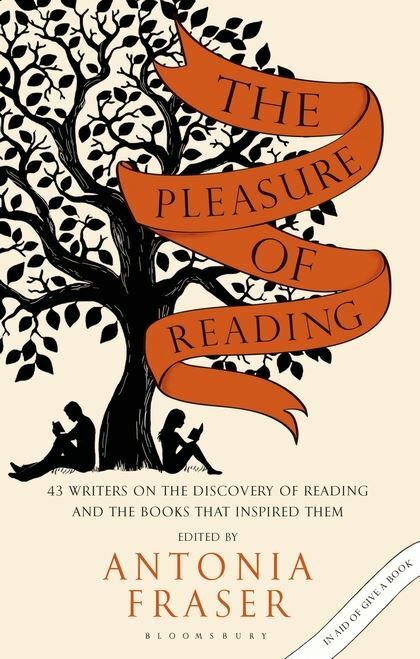 Produced in aid of Give a Book charity, it is comprised of forty three authors writing about how they started reading, often compulsively, almost as addicts, and how they have carried on . Some authors I knew well, others were new to me, but they represent a good balance of those who are sadly no longer with us and the more recent writers. There are those who became obsessed with reading as small children, some as a result of being read to, some as a result of reading everything they could get their hands on. Tom Stoppard writes about his reading at all the wrong times throughout his life, whereas Judith Kerr recalls reading when exiled from her country of birth. Some of these writers take the request to name ten favourite books seriously, others just list the books they could not live without on a mythical island. The influence of parents is often strong for writers as they produce the right book at the right time, other readers read despite their parents, sometimes free range with library tickets (familiar admissions that they found the adult section more interesting than those books offered to children). There is quite a lot of overlap of early reading, with the celebrated Alice books being frequently mentioned, as well as Dickens and the now politically incorrect books of Enid Blyton. There are lots of different authors mentioned, though this book doesn’t really provide a list of recommendations, and there is a lot of familiar territory here. A really memorable entry is by Roger McGough, whose childhood reading was limited. He writes “my favourite story was a tin of Ovaltine…’Sprinkle two or three heaped teaspoonsful of…”. Other writers recall childhood confusions such as Jane Gardam, whose mother’s promise to bring a ‘Porter’ was really a (Beatrix ) Potter. Others remember reading despite their teachers, or conversely being inspired by them. I should imagine that every reader will find familiar memories here, such as reading by half light when supposed to be asleep. It is a good book to pick up and put down when travelling or supposed to be doing something else, and there and some funny and interesting anecdotes. I found this a good read, providing fascinating memories of writers as they recall what enticed them into read. As “books about books” go, this is not a handy list to work through of recommendations, but it certainly makes me aware of stuff I haven’t read, or given to my offspring….